Safety first! That’s one of Elliott’s core values and we hope it’s one of yours too. In the hands of a trained operator, a crane is an extremely efficient way to lift and place heavy objects. But with an untrained operator, the same crane could cause property and physical damage. The Occupational Safety and Health Administration (OSHA) recognizes the hazards inherent in crane and boom truck usage and has published regulations that require operators become certified by a third-party operator and designated as “qualified” prior to using a crane rated to lift more than 2,000 lbs. Originally scheduled to take effect in November 2014, the mandate’s deadline was pushed back to November 10, 2017 to give operators more time to obtain this certification. Then, OSHA again delayed the certification requirement to November 2018. Given the shorter amount of time granted by the second extension, it appears unlikely this requirement will be delayed beyond November 2018. OSHA’s new rule describes a few different ways crane operators can meet the boom truck operator certification requirements. The most common way is for operators to be certified by a nationally-accredited crane operator testing organization. Both practical and written tests are administered and operators achieve levels of certification based on equipment capacity and type. Certifications by these agencies are valid for five years. Other ways to earn boom truck operator certification include qualification by an employer’s independently-audited program, qualification by the U.S. military or compliance with state or local licensing requirements that are at least as strict as federal guidelines. You can get a rundown of state-by-state boom truck operator certification requirements here. The certification requirement applies to operators of cranes above 2,000 lb. capacity when used in construction. Machines covered by this rule include Elliott BoomTruck and HiReach machines with a rated lifting capacity of over 2,000 lbs. Digger derrick operation is also normally regulated under these rules, but when used to auger holes for poles they are exempt. See OSHA’s current aerial work platform rules here. Current boom truck and derrick operator rules are here. OSHA additionally requires that employers train the operator in the safe operation of crane equipment regardless of lifting capacity. OSHA makes one small exception to the certification requirement. If an operator is not certified, they may only operate cranes covered under the rule after November 2018, if they meet OSHA’s definition of an “operator-in-training,” which includes having received sufficient training from the employer to operate the crane safely and being continuously monitored by an operator’s trainer. There are also restrictions on the types of lifts an operator-in-training can perform. OSHA also has requirements for signal and riggers personnel. Signal personnel must be qualified when point of operation is not in full view of the operator, view of direction of travel is obstructed or certain site-specific safety challenges exist. A qualified rigger is defined as a “qualified person” who, by possession of a recognized degree, certificate, or professional standing, or who by extensive knowledge, training, and experience, has successfully demonstrated the ability to solve/resolve problems relating to rigging. If a person performs any combination of these tasks, they must receive the proper qualification/certification before November 2018. Don’t put this off—deadlines can creep up suddenly. We recommend that operators, signal persons and riggers obtain these credentials as soon as possible. Not only will that avoid rushing to get certified at the last minute, but more importantly, it will contribute to a safe work environment for all. Get the ball rolling now. By completing boom truck operator certification in a timely manner, your team may beat competitors to the punch and win more jobs. 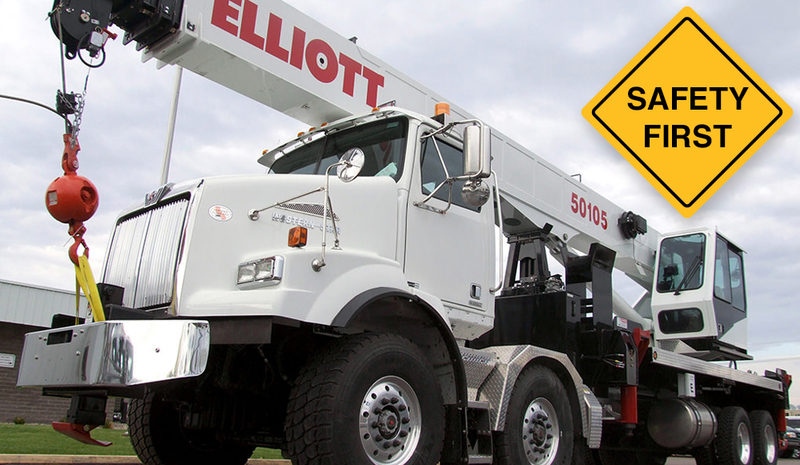 While you’re at it, think about whether it’s time to put a new Elliott BoomTruck model on your fleet. This guide can help you decide how to customize your next Elliott. We own two Elliots and are looking into whether derating them to under 2000lbs would be a benefit to our business. What are the procedures and rules that would apply?